This beautiful 1,500-acre preserve situated in the northern part of Flagler County was purchased by Henry Cutting in 1886 and passed on to his widow Angela Mills Cutting Worden, who eventually married Boris Scherbatoff, an exiled Russian prince. 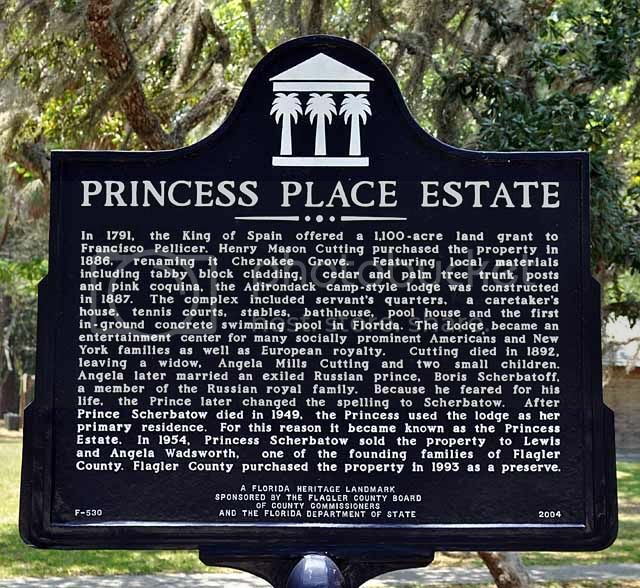 Angela assumed the title of princess and it was then that the once named "Cherokee Grove" came to be known as "Princess Place. The original lodge built by Henry Cutting stills stands as Flagler County's oldest intact structure. Also on-site is Florida's very first in-ground swimming pool.